Fantastic entry-level wireless mouse, particularly for those that prefer a vertical mouse. Lacks some features of higher end models, particularly around tracking and secondary button quality. I’ve mentioned several times that my ergonomic mouse of choice is the Logitech MX Master Wireless Mouse. I use one of at work and one at home and it just plain works really, really well. However, I recognize that it might not be for everyone, particularly given its relatively high price point. So with that, I decided to try out a couple other mice that have hit the market relatively recently. Particularly in the ergonomic mouse space, it seems that a number of new companies have popped up offering surprisingly affordable options with quite a few impressive features, not the lease of which are the fantastically ergonomic designs. These new mouse designs are generally not from the established players like Logitech or Microsoft. Instead, they are being produced by companies like Anker and Sharkk. When I first started looking into ergonomic mice, the one and only leader in the vertical mice space was Evoluent. It seems that these other companies have caught on now, not only producing fantastic vertical mice, but doing so at a very attractive price point. The Anker 2.4G Wireless Vertical Ergonomic Optical Mouse (wow, that’s a mouth full!) is one such mouse. The vertical mouse design is rooted in a relatively simple principle. 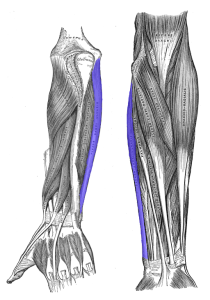 A relatively common injury that results from a lack of proper mouse usage is tendonitis of the flexor carpi ulnaris, a tendon located on the anterior of the forearm. It tends to flare up due to adduction and ulnar deviation of the wrist. By placing the wrist in a more vertical position, it is believed that ulnar deviation is reduced, and therefore the potential for injury. As I mentioned in my post on how to use a mouse properly, you shouldn’t be mousing from the wrist anyways. But for those of us that just can’t shake the habit, a vertical mouse might be a good first step. The ergonomics of the Anker mouse are solid. The wrist position isn’t so vertical that you lose precision, and I would estimate puts your wrist at roughly a 60 degree angle. In terms of size, I would say the Anker fits a hand roughly the same size as the Microsoft Sculpt Ergonomic Mouse, which means that it is perfect for a roughly average adult. It also has a nice rubberized finish and is less round than the Sculpt, which made it feel solid in my hand. Lastly, as far as I’m concerned, these days there is no reason to have a wired mouse anymore, but it is worth mentioning that the Anker comes with a USB dongle, which means that, even at its low price point, you don’t have to mess around with wires on your desk. There are, however, a few places that the Anker cuts corners. First, the tracking is not nearly as good as that of the higher end wireless mice. The Anker does have several different dpi options (800 / 1200 / 1600) that can be switched between. However, it lacks some of the more advanced tracking features pioneered by Logitech and Microsoft to deal with glare and imprecise mousing surfaces. On my model, the scroll wheel felt flimsy and difficult to control. There are only a couple secondary buttons, and their functionality is somewhat limited to back and forward. Finally, I am not a fan of rechargeable batteries. The Anker runs on 2 AAA batteries, which add weight and hassle. I might add, it doesn’t even come with these batteries included, which is just, well… cheap. That said, the Anker is a fantastic mouse for the price. I would definitely prefer it over my old Evoluent mouse, and it gets the job done. If you are a fan of the vertical mouse design, this is definitely a solid option, and it won’t break the bank. Ergonomic Design – The ergonomic vertical design fits the hand well, and places the wrist in a more neutral position. Multiple Tracking Options – Though not as advanced as the laser tracking on higher end mice, the Anker offers several dpi settings that can aid in tuning tracking in most situations. 2.4G wireless USB dongle – Offers wireless mousing at an affordable price. Poor tracking – The Anker just isn’t as precise as higher end mice from Microsoft and Logitech. Flimsy buttons – The buttons just don’t feel solid, particularly the secondary buttons and scrollwheel. The Anker is a great mouse for the price. It is definitely on the low end of the spectrum in terms of price and features, but it does offer a unique ergonomic design that may suit folks that prefer vertical mice. I would recommend it as an upgrade over the Evoluent for sure, though I would probable opt for a higher end mouse if possible, unless you really like vertical mice. Final Verdict: Good, Great for the vertical mouse crowd.